Based on the Standard Series guitars, the Marbled finish Fender instruments from 1983 and 1984 are "Limited Editions" and very few were made, making them relatively rare, unique and fun as no 2 of them are alike! When the Marbled finishes debuted back in 1983, it was something to behold. The guitar world had not seen this finish previously, and it wowed many of us. The finishes were created by floating paint on water and dipping the bodies in and out, which caused random swirls and patterns to emerge as the paints dripped off when the bodies were removed from the vat. Various “color schemes” were utilized and Fender settled on 3 of them, being primarily centered around Blue, Red, and Gold/Yellow themes. 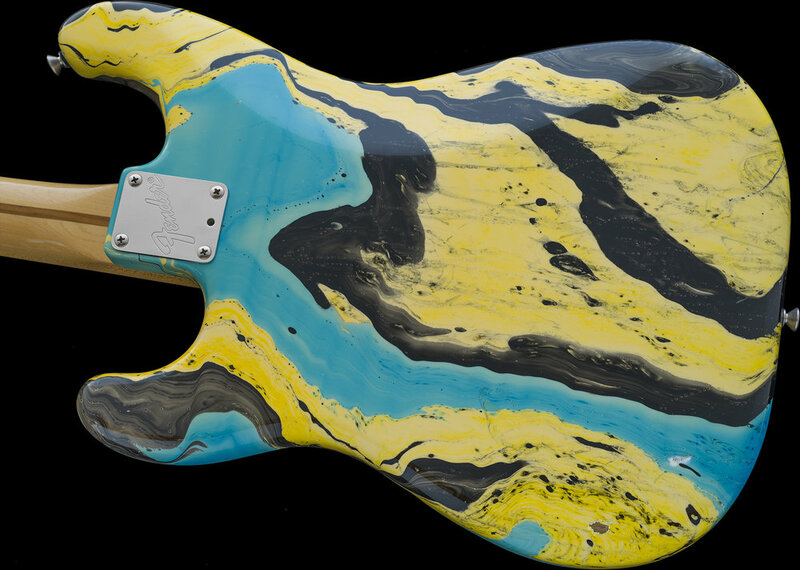 It is believed there were 225 Stratocaster guitars painted this way, making about 75 of each color theme. These original-issue guitars are very LIMITED EDITION Models. The pioneer of this finishing technique, Darren Johansen worked in Florida and was able to gain contracts for his work with Fender and later with Ibanez as well. In the late 1990’s, I had a few of my own Guitars “R” Us-branded instruments painted this way by Darren too! I have examined, tested, serviced and set-up this instrument and have found it to be factory-correct in every way. The finish, electronics, frets, nut and all of the chrome plated metal and plastic hardware are all factory-correct and original to the guitar. The potentiometers are both dated 1983. The guitar is immaculate and shows little sign of usage. There are 2 small paint chips on the BACK that can be seen on the treble side of the lower bout, if you review photo #5, you can see the 2 small paint chips. One of them is down to the wood, and luckily they are small and on the back! The guitar retains its original and difficult to find Torq-Master Tremolo Arm, which handily snaps in and out. These were designed to work with the re-envisioned Freeflyte Tremolo units! The necks of this period also received some more modernized updates. Along with headstock-adjust truss rods, which is a more practical placement, a wider nut width was designed, which is helpful for lower position chord playing and to facilitate easier string-bending, the fingerboard radius was flattened to 12º, and larger frets were used too! The CASE is a correct Fender injection molded plastic model and is Original to the guitar and is also in excellent condition with a functioning handle, latches, and hinges. I acquired this guitar 25 years ago while running my store. I always liked these finishes and when I found this one, I decided to add it to my collection. The guitar is now 35 years old and has been stored since I acquired it, and subsequently, it has been well cared for and spared all of the "circulation" that most instruments being offered online today have undergone. The guitar is striking to look at and is is 100% original and unmolested having never had any repairs, restoration, or modifications of any kind. This crisp and clean example may appeal to other discerning Fender Collectors too. If you have any questions or interest, please do inquire.